Hi from The Classroom Nook! 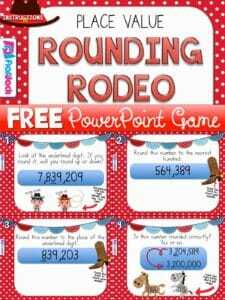 Rounding is skill that almost every elementary grade teaches on some level, and it is most definitely a foundation skill that all students will need! Many students, however, still struggle with the concept and could benefit from a visual resource to help give concrete examples for rounding. My Rounding With a Number Line activity is perfect for helping all student better grasp rounding. « Looking For Something Awesome to Teach Colors?